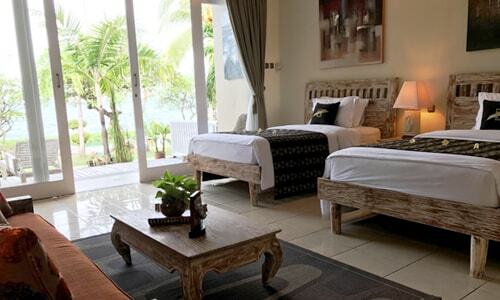 Tauch Terminal Resort Tulamben & Spa is a beachfront diving resort with sweeping views of the beautiful Bali Sea. 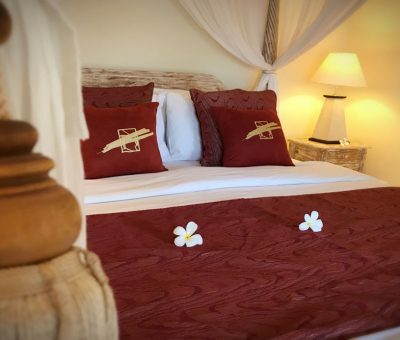 It boasts a Spa, 2 outdoor swimming pools, a beach & pool bar, a seafront ocean view restaurant and comfortable Balinese-inspired white wash antique style rooms – all with private terrace or balcony. Wi-Fi internet is accessible for free in all areas of the resort. 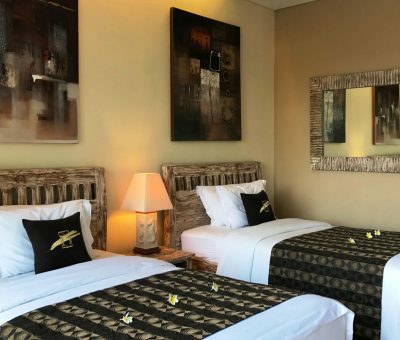 Set around tropical gardens, tastefully appointed rooms are equipped with air conditioning, spacious bathrooms, mini bar and a comfortable lounge area. 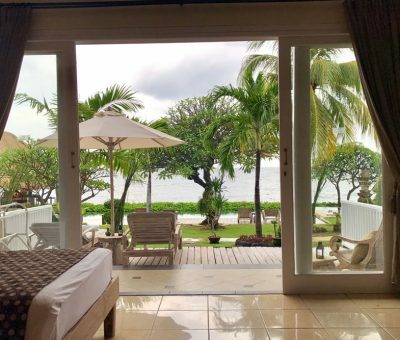 All rooms have ocean, garden and pool view. Guests can sun tan at our sun loungers around the pools, go snorkeling or participate in our various daily offered diving trips. Soothing massages and relaxation waits at the resort’s own spa. Our staff at the front desk is glad to assist with ticket reservations, sightseeing tours, vehicle rentals or shuttle services. Drop Off Wreck Diving in front of our resort! 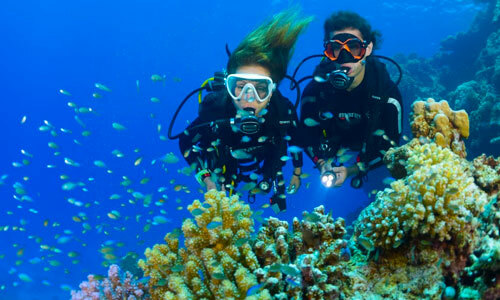 Dive & Snorkel trips around Bali’s best and most famous dive sites. 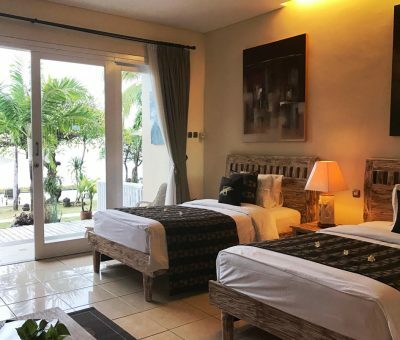 Please check our website frequently for special offers on seasonal room rates, dive packages and Bali dive trips or sightseeing tours. Tauch Terminal Tulamben Resort & Spa – Massage & Various Spa Treatments for relaxation and for good feeling! Excellent resort. Superb rooms with spotless garden and pools. Right on the Beach. Unfortunately very expensive restaurant and dive center. You cant just simply rent a tank and go diving like in other places in Tulamben. Tauch Terminal is the best resort for your stay in Tulamben. The dive staff here is excellent. The resort sits right outside of the Liberty wreck for an easy access to the site. You walk straight in from the beach. Additional sites are close by and if you mention to your guide that you’d like to see something, he will usually find it! THE BEST IN TULAMBEN!! I stayed with my girlfriend in this beautiful resort for a week. The garden and the pool area looks even better then the pictures on internet. My girlfriend did a diving course with an instructor from the resort and enjoyed it a lot. I did fun dives with the local dive guides, they was professional and knew all the dive sites perfectly. Highly recommend, we will come again! We had a week here at the beginning of our trip to Indonesia. My son and I are divers and organized a 5 day full dive package while my wife and younger son enjoyed themselves at the resort and with making day trips that can be arranged by the resort. The resort is very relaxing with excellent service. The rooms are excellent small terrace outside looking at the ocean!! Personnel is very friendly and flexible to arrange unexpected requests. We happen to be there during a major day for Hindi and asked if we could join a ceremony at one of the temple. The resort arranged for the gardener/driver to take us to his temple and he did a great job to let us experience us the full ceremony. We did a day trip to the waterfalls with Mari driving us. Excellent service and well be taken care of. The diving team are all great guides who take care of necessary safety. We would strongly recommend this place to anyone who wants to enjoy diving and relaxation…. We stayed at the Tauch Terminal for 8 nights as I did my open water dive certification. The hotel is rather small which gives it a homey feel. 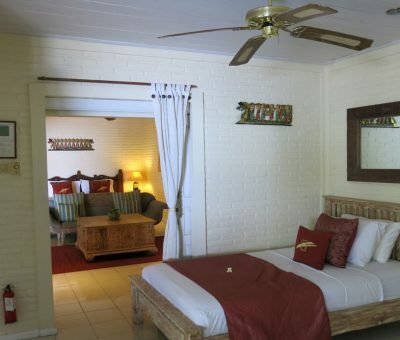 It is also situated directly by the beach and I believe all rooms have the ocean view. It also has 2 pools and the territory is very cute and very well kept. The room we stayed at was spacious and had a big balcony. 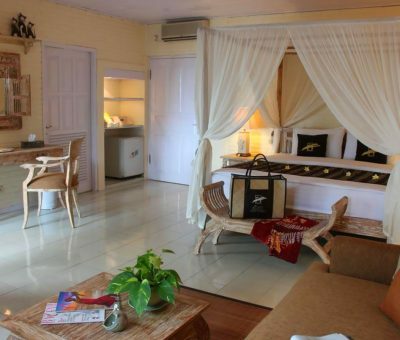 The interior design has a Bali feel to it, which also adds to the charm. Also, the room was clean and had an AC. 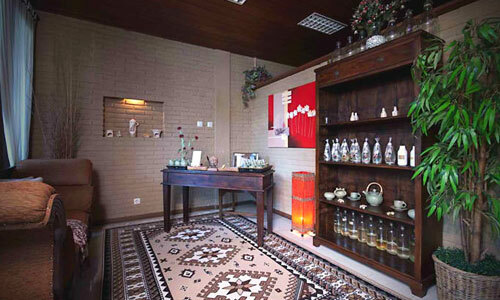 The Spa is also very nice with a good variety of treatments. The stuff is very friendly and helpful. Overall we had a great time staying there.